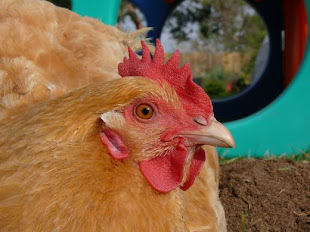 Chicken Blog: Cluck, Cluck, Cluck, Roof! Zelda, Silkie Princess, what news? She replies in a chattering of clucks and whirrs. "There seems to be a great deal of activity, across the yard, next to the old compost pile. We visit frequently, and ponder its meaning and purpose. And then we go back to digging through the straw, and flower beds. The days are longer, warmer, and we love the company we've had this week." I know. She's, frankly, quite articulate. I 'm sure she is referring to the barn William and Geoff are building. All the chicas have been milling around, and under, and they assume the airs of building inspectors when they walk through and eye-ball the corners and boards. Betty couldn't be bothered to join the group for a family photo. She was still checking the roof joists, and testing the subflooring. The rest of the chicas came running to drink. I was indulging them with some over the top hospitality. The shark cage, and other amenities, is at the opposite end of the yard from where they love to hang out, so I served them a cool dish of Dihydrogen monoxide, a chemical concoction they love. I am careful to regulate how much they get, but I've never known them to take more than necessary. Clucking and whirring, they thanked me for my thoughtfulness. Ivey, is she the one? The "weird" looking one? Honestly, you're right. She does have a look uniquely her own. I cannot always see her peepers, which hide beneath her fluffy up-do. Her colors are... well, I've never seen another like her. And the weirdness of her, makes her kind of awesome. And her feathers are bunny-soft, Kamen's too. Enough clucking... let's follow the hens and go to inspect the barn! Who wants to make a beam me up joke? Now that Geoff is back to work, the progress is made on the weekends, and evenings. And they are progressing! First of all: I love, love, love the beam. Both William and I have been awestruck by how legit and swanky classy elegant barn-y it makes the barn look. They're almost done with the roof sheathing. Today they are putting in windows, and then siding. I'll bring the chicas more water, and pass three inch deck screws to Geoff and William. Pretty much, I do a lot of the technical support kind of jobs. Looks terrific! Geoff and Will are doing a great job as usual! What a wonderful post! I love seeing the chicas all gathered round. My cats do the same thing whenever we are doing something interesting. I love seeing the barn being built. I can just imagine all the things you are going to do when you have your very own barn. It's all exciting to watch! Ha ha--I was just thinking She-Bot looks like the kind of chicken a Klingon might raise, when *boom* you hit me with "beam me up!" This is just as impressive as that barn going up. I think you might be doing the job of a gaffer. Or not. I think you need tape for that. But it sounds good anyway, and maybe there will be tape later. Your chicas make me happy! I'm so glad you take and share pictures of them! And that barn, it's a right lovely barn! Exciting!! It's beautiful work those men of yours are doing! Barn looks awesome - are you thinking about a metal roof?? Geoff could come into our shop and fab it up himself! !